The Southview Grace Brethren Church of Ashland, Ohio, (Larry Edwards, pastor) celebrated its 50th year of ministry the first Sunday of October. Former Pastor Donald Farner spoke on “The Year of Jubilee” to the 152 who were in attendance. There were several musical specials, including a concert by Nancy Messner and Jim Messner. It was Jim Messner’s father, Glenn, who was on the original board of trustees of the church for starting Southview. Many gave testimonies as to what the West 10th Street Brethren Church and Southview Grace Brethren Church meant to them. A fellowship meal followed the concert. The Southview church had its beginning as a branch of the West 10th Street Brethren Church, eventually re-named the Grace Brethren Church. Because of overcrowded conditions and with the foresight of several individuals, in 1957 Southview was born. 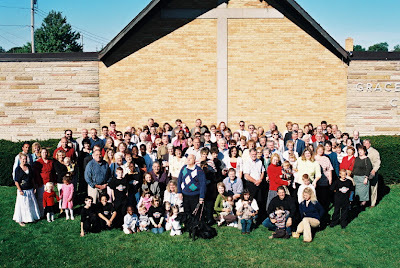 It was originally called “one church with two locations” but in 1965 the church was named Southview Grace Brethren Church and the following year was officially organized as a separate church body. The first pastor was Dr. Miles Tabor, and his assistant was Eddie Cashman. Other pastors who followed included William Kolb, Mason Cooper, Charles Martin, Donald Farner, Gary Miller, Gary Taylor, Steve Burns, and Randy Haulk.